There is a fascinating (to some) paradox in piano tuning. To be perceived as being “in tune” a piano must be tuned precisely “out of tune”. In other words, intervals that one would assume to be “pure” such as the octave and perfect fifth, are in fact not pure by a very small and specific amount. To see why this is, we have to explore the worlds of equal temperament, inharmonicity and piano tuning. There are many musical scales in the world. Western music is built on a scale of 12 chromatic notes that form an octave. These 12 notes evolved as our understanding grew of the Harmonic Series or Overtone Series. This sequence of notes, both in mathematical theory and in actual use, forms the basis of what we know of today as western music. The harmonic series is built on the natural subdivisions of a vibrating string. When the string vibrates from end to end, it forms the Fundamental. When it is divided in half the pitch produced is an octave above and is called the second harmonic or second partial. It is also referred to as the first overtone. When the string is divided in thirds, the resulting ⅓ length produces the pitch and octave and a fifth above the fundamental. And, just for chuckles, we'll tune this to vibrate at 440 cycles per second. This is what is referred to as A440, a generally accepted standard pitch. We’ll also call this A4, because it is in the 4th full octave (C to C) on the piano. The piano keyboard is divided into 7 octaves + a few notes. The 7 octaves are from the lowest C, known as C1 in the bass to the highest (normal) note on a piano: C8. The A, A# and B that are lower than C1 are known as A0, A#0 and B0. We’ll also call it the FIRST HARMONIC and we’ll produce this pitch by stretching a steel wire and adjusting its tension until it vibrates at this pitch. The Second HARMONIC is A5, one octave above the Fundamental and is found by multiplying the Fundamental by 2, or dividing the string length in half. The THIRD HARMONIC is formed by a 3:2 relationship with the Fundamental. This second overtone is the pitch E6, one and ½ octaves above the fundamental. Continuing to multiply the original pitch in a sequence gives us the harmonic series and our Western keyboard and musical vocabulary. As musicians throughout the history experimented with different pitch making sources, the interval of a fifth, or perfect fifth became an integral part of the musical language. This is because it is a pitch easily and naturally produced by a variety of primitive instruments, including the voice, tubes of various lengths and plucked strings. A piano tuner trains his ear to hear these overtones. She must be able to hear and compare specific overtones that coincide between 2 notes and make minute changes in the tension of the string to adjust the pitch of the coinciding overtones. As musical history progressed, the particular oddity of the harmonic sequence began to show its head. If you keep multiplying the original frequency in a series (2,3,4,5…) the resulting pitches vary slightly from a perfect multiple of the original. This is a phenomenon of mathematics because the multiples in an infinite series diverge slightly. The further up you go in the harmonic series, the greater the notes diverge from their lower cousins. Even though this divergence was known in the time of Pythagoras, the real world impact of this divergence was not noticeable until the development of polyphonic music and keyboard instruments. When musicians in history began tuning their clavichords, harpsichords and early pianos they noticed that they could not develop a clean, harmonic octave by building a set of consecutive perfect 5ths. An oddity in mathematics shows up in real life in that you can’t tune a piano using what would otherwise seem to be a simple mathematical formula: consecutive Perfect 5ths. You should be able to stack Perfect 5ths on each other and come out, 12 notes later, in the same place….but you don’t. One solution is to tune an instrument so that the octaves, fifths, and/or thirds are perfect or very close for the important chords from some keys (generally “easy” keys like C, G, and D) but terrible for some other keys. Those systems (often meantone temperaments) ended up with “wolf fifths” that were much narrower than perfect fifths. An instrument with a wolf fifth couldn’t really play in certain keys. And, in fact, this is what people did for many years. An examination of the musical literature will show a predominance of music written in and modulating among these “easy” keys, keys that sound harmonic and pleasing. Excursions into the more “difficult” keys was reserved for tonal impressions of dissonance and evil. that when you create a tuning across the piano using pure intervals of the 5th and Octave, the result will sound in tune in one key. But as one plays in different key signatures, the piano will sound progressively and then wildly out of tune. The resulting octave will have an accumulated error and will not be a perfect multiple of the original. This is because an octave DOES NOT consist of 12 perfectly calculated fifths. The resulting error is called the wolf or the comma . Tempering a scale is the process of slightly adjusting each pitch out of its mathematical frequency so that all the resulting pitches fit within in octave. There are many different ways to temper a musical scale and many different temperaments have evolved. However, the 800lb gorilla in the room is Equal Temperament. Equal Temperament is the system that is in general use throughout the parts of the world that use the 12-note chromatic scale. In equal temperament, emphasis is still given to the 5ths, they are just no longer pure. Rather they are contracted slightly, usually by making the upper pitch of the interval slightly flat. Equal Temperament Spreads The Error Evenly Over All Twelve Notes. This means each key signature has the same degree of dissonance and that there is no Wolf. You spread this error by making the fifth slightly narrower and the fourths slightly wider. This also means that in equal temperament, the resulting major thirds have a very pronounced beat to them that they did not have in the less equal temperaments. While purists and advocates of historical temperaments object to this rapidly beating third, it has become an accepted part of the experience of western music. 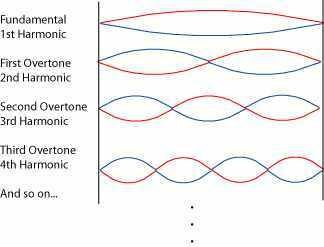 Here is a great link that describes the relationship between the harmonic series, vibrating strings and piano tuning. If tempering the forths and fifths was all that was required to tune a piano properly in equal temperament, that would be enough of a challenge. But pianos, specifically the steel wire used in piano strings, present another set of problems. Inharmonicity is a physical problem that results in a mathematical one. Because the wire in a piano is made of steel, each string has a degree of stiffness. Because of the stiffness of the wire, the string does not start bending exactly at its theoretical perfect node. This slight stiffness results in throwing off the whole overtone series in a piano which is called inharmonicity. If one were to tune a piano without stretching the octaves, the partials of the low bass notes would clash noticeably with the fundamental and partials of higher keys. To make the low, thick low bass strings sound in tune with the very high treble notes, the whole piano tuning must be stretched by making the octaves slightly wider than pure. This means the notes above the starting pitch will all be a slight but precise amount sharp and the notes lower than the starting pitch will be slightly flatter. This is called a stretched tuning. Essentially, a piano tuner is putting your piano precisely out of tune. A piano tuner accomplishes this by stretching an octave by a slight but precise amount. But even this is a judgement call that depends on the piano being tuned and the preferences and skill of the tuner. A tuning that is more stretched will sound quite bright in the treble and have noticeable beats in octaves and double octaves. A more pure or less stretched tuning will sound cleaner (though the octaves will still not be pure) but may not have the same inharmonic brightness in the treble. Both styles have their proponents and piano designs can enhance one particular style over the other. The higher up the piano quality “food chain” one goes, the more the differences in styles of tunings become evident and significant. A piano tuner listens to particular harmonics of a pitch rather than the fundamental pitch. These are also called overtones or partials. A tuner will listen for beats coming from coincident partials of two fundamental pitches and will tune the note to the reference pitch so that one or more of these coincident partials are in tune. Here is the catch: they can’t all be in tune. Which set of coincident partials a tuner chooses to listen to has impact on the resulting tuning of the fundamental notes. A particular interval will have more than one set of coincident partials, but because of inharmonicity it is unlikely that more than one of these sets will be in tune, requiring the piano technician to make a choice of which set to listen to. Let’s take an example of two notes forming an octave. 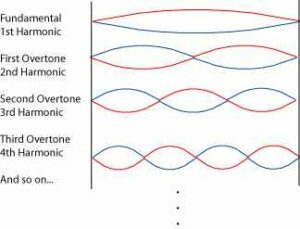 If a tuner listens to a “2:1 octave,” he or she is tuning the top note to the lower reference note so that the 1st overtone of the top note is tuned pure with the 2nd overtone of the lower note. In the case of a 4:2 octave, if C4 is the reference pitch and C5 the pitch being tuned, the tuner will tune C5 so that the coincident overtone, or partial, C6 is pure or beatless. The tuner is not focusing on the intersection of pitches from the Fundamental of the 2 notes being played. He is listening up in the harmonic series, to the intersection of 2 specific partials. In a 2:1 octave, the coincident parial being listened to is C5. In a 4:2 octave, the coincident partial is C6. In a 6:3 octave the coincident partial is G6. The higher the coinciding partials, the more stretch is being put in the tuning. Listening to a lower set of coinciding partials makes the overall tuning more pure. As you can imagine these coinciding partials are quite high and quite soft. To hear and manipulate these high partials requires intense and time consuming training of the ear. The process of developing this acuity of hearing is a big hurdle in the process of becoming a piano tuner. Learning to tune by ear is hard and takes a sustained effort over a long time. Even then there is great variability in the end results as some tuners are more careful and conscientious and skilled at getting the strings tuned to their optimal point for a given piano. Electronic tuning devices have been around for decades but were only used for single pitch instruments. It was generally accepted that the earlier devices were not accurate enough for piano tuning. That has changed with the development of modern computing. The advent of affordable programmable microchips meant that the computing power needed to accurately tune a piano was available. One of the earliest modern devices was the Sanderson Accu-Tuner developed by Dr. Albert Sanderson, a Harvard Physics faculty member and avid piano tuner. Since the arrival of the iPhone and Android devices, accurate EDT’s are available in shirt pocket size. TuneLab, Reyburn CyberTuner and Verituner are the best known. Electronic Tuning Devices have brought great benefits to the field of piano tuning, BUT an ETD alone does not tune a piano. 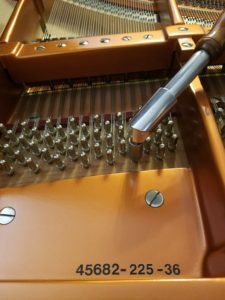 A piano tuner must still make specific choices in the process of tuning a piano and must have fine motor skills to be able to manipulate a tuning hammer to make fine adjustments to the pitch of a string. The result must still be harmonious and pleasing to the ear and must last. There are many challenges to creating a stable, long lasting tuning but that is beyond the scope of this article. In the piano tuning profession, it is generally accepted that when using an ETD the best results are obtained by combining the output of the ETD with a trained and experienced ear and this can only be achieved after hundreds of hours of practice and training. For example, to achieve RPT (Registered Piano Technician) status in the Piano Technicians Guild, a member must be able to tune a temperament by ear, whether or not one uses an ETD in regular practice. This ensures that the member knows how equal temperament should sound and does not blindly take the results dictated by an ETD. There is a wealth of material available on the subject of tuning.